New Music: There’s an App for That! The average American spends nearly five hours a day on their smartphone. That’s about a third of their waking life. What could we possibly be doing for all that time? Well, usually we’re just wasting it—we’re scrolling through our Facebook feed to pass the time on a long bus ride, Snapchatting our friends from across the room during a TV commercial break, Instagramming our afternoon coffee, or checking for new matches on Tinder. So much time wasted swiping left, right, upside down, right-side up—which is why I figure if we’re going to spend hours on our phone each day, we should at least make it worth our while. Why not spend that time improving our rhythm, enhancing our musical knowledge, exploring new music, or listening to some of the greatest artists and thinkers of our time? Okay, so this one’s an obvious pick—but here’s why: our app gives you on-the-go access to our carefully-curated 24/7 live stream, expansive video archive, on-demand concert recordings, new music event calendar, Joshua Roman blog posts, album reviews, and much more. You can also create a “Favorites List” of pieces you hear on the stream, or even set a custom alarm clock so that you can start each day with the latest in contemporary classical! And rest assured, there are no commercials, no top 40, no corny talk radio—just 24/7 new and unusual music from all corners of the classical genre. Oh, and did I mention it’s FREE? The 20th century composer and iconoclast John Cage is most famous for two main contributions to the classical canon: 1) his “silent” composition, titled 4’33”, and 2) his prepared piano pieces. The John Cage Trust has created apps out of both. Cage’s three-movement 4’33″ is perhaps his most famous composition, teaching audiences that there is really no such thing as “silence,” but rather, the sound of the world around us is music in and of itself. In the app, you can capture your own three-movement performance of the ambient sounds in your environment, then upload and share that performance with the world. You can also listen to others’ performances, and explore a worldwide map of ever-growing performance locations. But here’s the coolest (read: geekiest) part: the app features a recording of the ambient sounds at play in Cage’s last New York apartment, which he found a source of constant surprise, inspiration, and delight. Cage threw a wrench in the Western classical tradition (literally) when he invented the prepared piano in 1940. By placing everyday objects such as screws, bolts, and pieces of rubber between the strings of a grand piano, he created an entire percussion orchestra within a single instrument. Now, you can create your own entire percussion orchestra—within a single smartphone. Choose from dozens of sampled sounds of a piano prepared with the actual materials used by John Cage in the preparations for his Sonatas and Interludes, then record your performance and share it with the world! Composer and electronic musician Dan Trueman gave the original 20th century prepared piano a 21st century facelift last year when he created the prepared digital piano. Instead of bolts and screws stuck between the piano strings, virtual machines adorn the virtual strings—transforming the piano into an instrument that pushes back, sometimes like a metronome, other times like a reverse delay. The virtual strings also tighten and loosen on the fly, tuning in response to what is played. 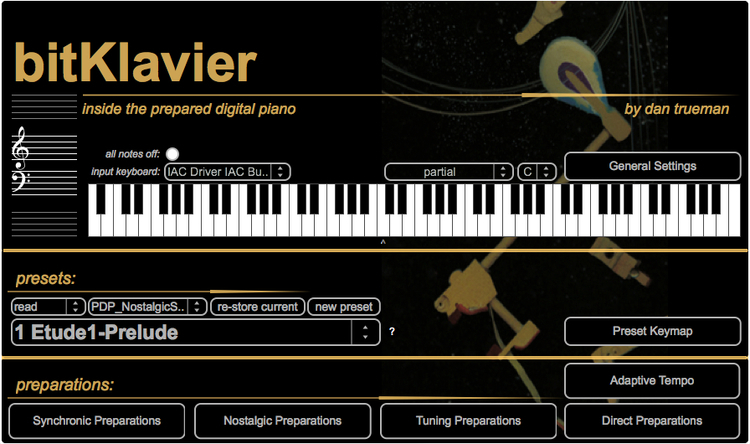 And in true 21st century fashion, you can download the prepared digital piano as an app, plug it into your MIDI keyboard, and create your own compositions. Percussionists are on their game when it comes to new music apps. Third Coast Percussion actually has three: John Cage Quartet, the Music of Steve Reich, and Resounding Earth. The John Cage app is based on his 1935 Quartet, which is scored for “any four instruments or sounds.” With this app, you can choose from a variety of pre-recorded sounds or record your own sounds to create a custom version of the piece! The Steve Reich app allows you to create your own music using compositional techniques made famous by this minimalist composer, including phasing, additive processes, and canons. You can even record and sample your own sounds to make it truly your own! Resounding Earth is the title of a 2012 composition written by composer Augusta Read Thomas for Third Coast Percussion. In the piece, the group performs on over 125 bells from all over the world. This app allows you to explore the incredible sounds and history of many of the bells featured in the composition, enriching your own knowledge of percussion practices around the world! Phil Kline’s Unsilent Night is an electronic composition written specifically for outdoor performance in December—but you and your friends can perform it anytime of year (as long as you have smartphones). Participants each download one of four tracks of music which, when played together, comprise the ethereal Unsilent Night. Gather up as many friends as you can around a pile of boomboxes, speakers, or any other type of portable amplifiers, and instruct everyone to hit “play” at the same time. Then walk through the city streets creating an ambient, aleatoric sound sculpture filled with shimmering bells and time-stretched hymnal melodies. In 1972, minimalist composer Steve Reich composed a piece using very minimal musical means: just two people, clapping. Sounds simple, but it’s actually pretty difficult: two people clap the same short rhythmic pattern, with one repeatedly shifting their pattern by a beat until the two patterns align again. This app allows you to test your own rhythm by tapping in time with Reich’s constantly shifting pattern, gradually progressing through all of the variations. Choose from “easy,” “medium,” “hard,” or “practice” modes to up your rhythm game—if you achieve a high score, you can enter into a competition for the chance to perform the work live. And, you can also take part in a research project which investigates how people learn rhythm. Okay, so this one is about 30 percent Russian spy cryptology but 100 percent awesome nonetheless. The idea was inspired by old Soviet technology that uses visual codes for sound synthesis. Here’s how it works: PhonoPaper is essentially a graphical representation of sound (this can be music, a human voice, etc. ); in other words, it is the two-dimensional audio barcode of the sound. This app allows you to 1) generate your own PhonoPaper by converting a recorded sound into image, and 2) use your phone camera as a real-time PhonoPaper-code reader, to convert the image back into sound. How cool is that? You can even use the code reader to convert graphical representations of musical scores back into music—check out their site for some examples using pieces by Bach, Mozart, Lully, and more! So whether you’re secret coding your latest symphony, clapping through a Steve Reich simulator, or just kicking back and listening to the Second Inversion stream, there’s so much music to be heard! Why waste time on social media when you have all these incredible new music apps at your fingertips?